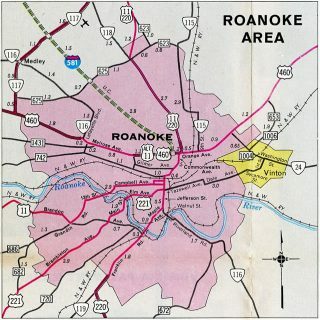 Interstate 581 is a spur leading south from I-81 to Roanoke–Blacksburg Regional Airport (ROA) and the independent city of Roanoke. The urban freeway is cosigned with U.S. 220 as part of its route between Martinsville and Covington. I-581 is also incorporated in the Future Interstate 73 corridor through Virginia. Exit numbers along Interstate 581 utilize cardinal direction based suffixes. Interchange numbers increase from north to south, contrary to standard Interstate numbering. The southernmost section of I-581 under construction in 1967. Subsequent freeway segments built south were only designated as new alignments of U.S. 220. See Virginia @ AARoads – Interstate 581 for photos from this direction. 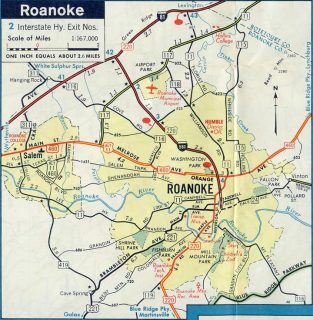 See Virginia @ AARoads – Interstate 81 North – Montgomery & Roanoke Counties for coverage. Interstate 81 & U.S. 220 parallel the south slopes of Green Ridge to the directional T interchange (Exit 143) with Interstate 581 south. Photo taken 08/06/13. U.S. 220 turns south along side I-581 through Roanoke as it concludes a 6.45 mile overlap with Interstate 81 south at Exit 143. The US highway historically combined with U.S. 11 south from Hollins to Downtown. Photo taken 08/06/13. Interstate 581 & U.S. 220 elevate along a viaduct over Norfolk Southern Railroad tracks on the 0.75 mile approach to Virginia 24 (Elm Avenue). Virginia 24 ends just west of Exit 6 at Virginia 116 (Williamson Road). Photo taken 08/06/13. An end shield for I-581 stands below the forthcoming Elm Avenue overpass. 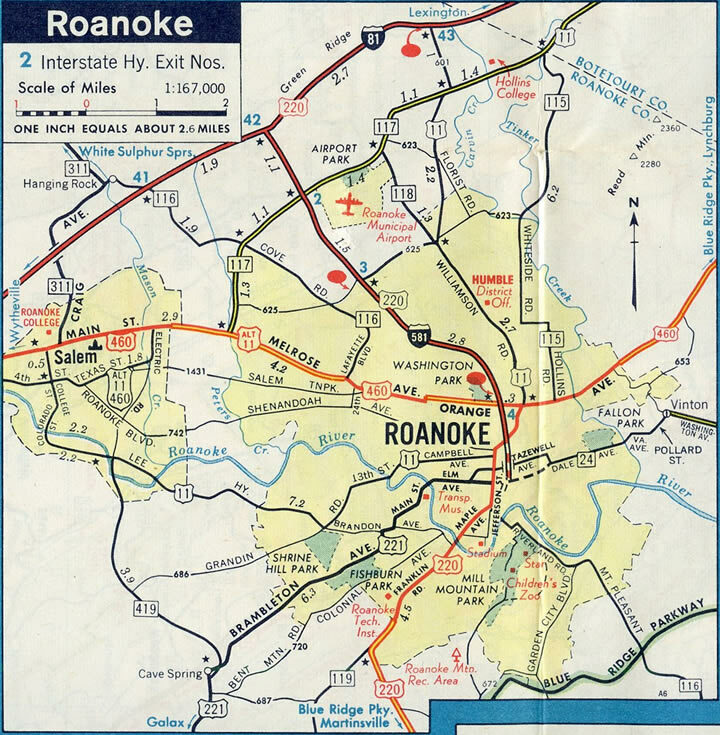 U.S. 220 extends the freeway south from the diamond interchange (Exit 6) with Virginia 24 to South Roanoke and Cave Spring. 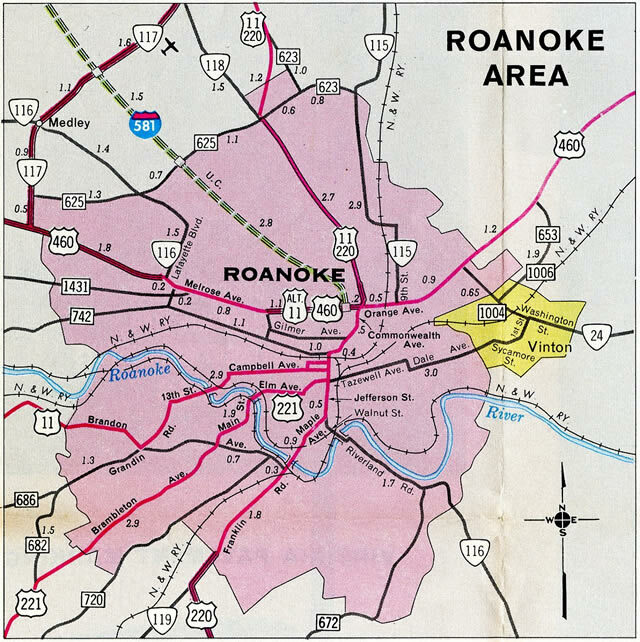 SR 24 leads east from Downtown Roanoke to the town of Vinton. Photo taken 08/06/13. See Virginia @ AARoads – Interstate 581 for photos from this perspective. “Valley View Interchange project to finish in time for Black Friday.” WDBJ (Roanoke, VA), November 16, 2016. Interstate 581 and Valley View Interchange Improvements. http://www.virginiadot.org/projects/salem/valley_view_interchange.asp VDOT project web site, accessed November 28, 2016. Page updated November 30, 2016.